Synopsis of Horrorstör by Grady Hendrix: Something strange is happening at the Orsk furniture superstore in Columbus, Ohio. 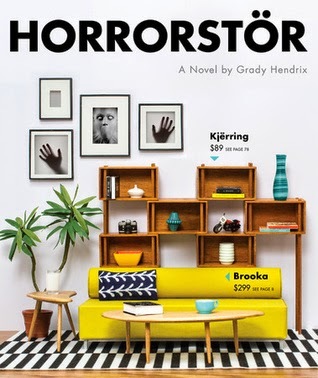 Every morning, employees arrive to find broken Kjerring wardrobes, shattered Brooka glassware, and vandalized Liripip sofa beds clearly, someone or something is up to no good. Welcome to Orsk, IKEA copycat in the US. It's a DIYer's heaven with inexpensive furniture and fantastic marketing and packaging. But one morning, there is more grossness happening after hours on the furniture than just a simple vandal, and the boss is keen to find out who's been causing trouble. Employees spend the night to investigate and discover that Orsk is haunted. But by whom, and why? Find out in this campy horror/mystery story, and be prepared to cringe while ruminating on the woes of consumerism and drudgery. The layout. I thought the layout would feel gimmicky. It did at first and I couldn't help myself from flipping through it. It has the requisite map, even order forms, and little furniture "blueprints" (ala IKEA assembly instructions) at the beginning of each chapter. There's even Grady Hendrix's Orsk employee ID card at the back! I had to get the layout appeal out of my system before I could settle into the story. My advice: do the same. The layout starts to take a turn when the storyline does too. I thought that was a neat little touch. The interplay of visual and story may surprise you. I honestly wasn't expecting to like this because I generally steer clear of the horror genre! Pretty profound under the slick packaging. The horror aspect of this is pretty tame but you'll get the blood, gore, and zombies in it, as you'd expect it. It's scary in an entertaining way. But the "horror" has a moral to it and the "horror" is actually more psychological than real: this is a satire about work, in all its mind-numbing, creativity-killing, treadmill-y tediousness. Layer this with the insidious horror of consumerism, people who will lap up the Kool Aid of corporate America, and are faced with the consequences of dead-end career choices. The characters are pretty mundane. But that's what makes them relatable. We all know that working in retail is pretty thankless and it's the characters' relatable back stories that I think many readers will be able to latch on to. Do you have a family, kids you need to take care of? Do you come from humble beginnings? Are you struggling to make ends meet? Are you the boss who has totally bought into the corporate line? Are you the reliable store employee who will bend backwards for a customer? Are you the one who toes the line and speaks out when the corporate line is, well, crap? These contribute to a rather creative ghost-mystery story that saves it from being a campy, gimmicky book in an IKEA-esque packaging. Verdict: An extremely creative and original "horror" story that is an insidious commentary about working in corporate America. I highly recommend this for someone looking for a read that will scare the sh*t out of them when they're in a work stupor. I received a copy of this book through the publisher Quirk Books for review consideration. I'm slightly fascinated by this book.